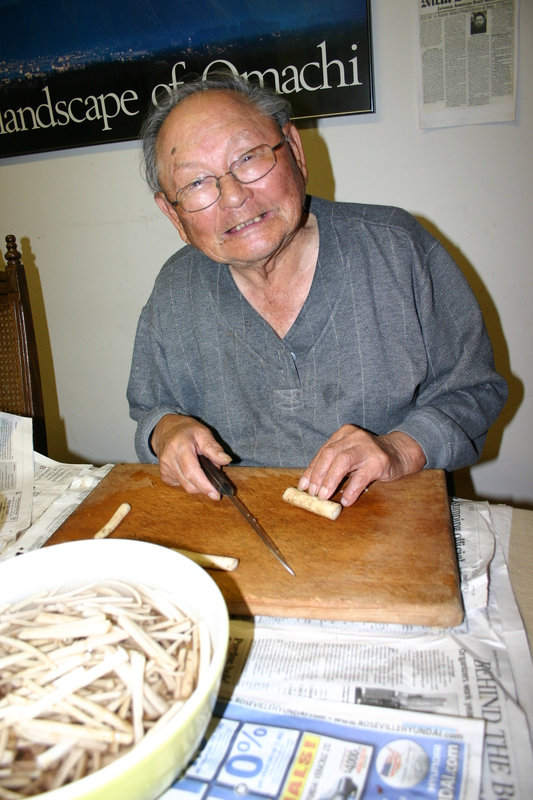 Noboru Taguma cutting his home-grown gobo. WEST SACRAMENTO, Calif. — Noboru Taguma, a longtime farmer and Nisei draft resister who took a principled stand during World War II, passed away peacefully at his home in West Sacramento, Calif. on March 11, 2011. He was 87. A native of Broderick, Calif. who was born on April 3, 1923, he retired in the early 1990s after farming tomatoes for 45 years, mostly for Campbell’s Soup, around Clarksburg, Yolo County, Calif.
During World War II, he and his family of nine were uprooted from their home in Broderick (now part of West Sacramento) and forcibly relocated, first to the Merced Assembly Center — a converted fairgrounds where they spent four months — and then to the Granada (Amache) concentration camp in Colorado. He was one of only 300 young Nisei to resist a military draft imposed behind barbed wire based upon constitutional principle — and one of just 36 such young men from the Granada concentration camp. He stated he would gladly fight for his country if his family was released from the wartime concentration camps and his citizenship rights were restored. While awaiting trial, the young Nisei resisters from Granada were visited by two leaders from the Japanese American Citizens League — Min Yasui and Joe Grant Masaoka. While the young Nisei men were eager to meet with them, one by one they were told to go into the U.S. Army. Noboru Taguma and two other resisters who similarly voiced their anger — in his case, yelling at the two and then slamming the door — were then sent to solitary confinement in an apparent attempt to break their will. Once shunned by so-called “community leaders” and subject to community ostracism, the resisters today are heralded for the civil rights stand they took. After serving his sentence at a Tucson federal labor camp, he relocated to the town of Granada, Colo. to be near his family. Although he was barred from the camp, every night for about one month, he either walked or hitchhiked three miles to the Granada (Amache) concentration camp, timing the searchlights on the guard towers and sneaking into camp to be with his family. There, he would eat or watch movies, and leave when warned about the presence of military police. Again, at the risk of getting shot, he snuck back out of camp, trekking back to the town of Granada. Later, hoping to get him and his family closer to home to the Tule Lake Segregation Center, he renounced his citizenship. Picked up by the FBI while visiting his friend in Denver, Colo., he was sent to the Santa Fe internment camp in New Mexico for nine months until the camp was closed. He was relocated to the Crystal City internment camp in Texas, where he stayed for nine months before being recruited to work in Seabrook, New Jersey. There, he served his one-year probation before finally being released. For the majority of the 120,000 persons of Japanese descent who were imprisoned during the war, freedom arrived in early 1946. For Noboru Taguma, freedom was not a reality until September 20, 1947. The incarceration saga deprived him of his freedom and family during precious years of his life. Noboru would get recognition for the stand that he took. In 1994 the Florin chapter of the JACL honored him and other local resisters with their Daruma Civil Rights Award. The Catalina Federal Prison Camp where he was sentenced to, located northeast of Tucson, was renamed the Gordon Hirabayashi Recreation Site in 1999. Noboru Taguma was among the resisters whose story was captured along with Hirabayashi, who challenged the government relocation orders during World War II. In 2000, the National Japanese American Citizens League voted on a resolution to recognize the resisters and the stand that they took. Two years later, the JACL held a national reconciliation ceremony to honor the resisters in San Francisco’s Japantown. He was predeceased by his parents, Iwakichi and Iwa Taguma, who immigrated from Yamaguchi Prefecture, Japan, as well as younger sister Shizue Susie (Jack) Furutani and niece Cynthia Bruers. He is survived by his beloved wife of nearly 53 years, Sakaye (Yoshizawa) Taguma; daughter Masako Carol Yasue of Nagoya, Japan; son Makoto Mark (Alice) Taguma of Mountain View, Calif.; daughters Mariko Sharon (Benjamin Kam) Taguma of Union City, Calif. and Machiko Gail (Andy) Irie of Torrance, Calif.; and son Kenji Glenn Taguma of San Francisco. He is also survived by his 10 beloved grandchildren: Kengo and Shingo Yasue of Japan, Cheryl Yoko and Kristie Akiko Taguma of Mountain View, Elise Makiko and Spencer Minoru Kam of Union City, and Lauren Mayumi, Brandon Kota, Jason Shohei and Michael Shinzo Irie of Torrance. Surviving siblings include older sister Kiyoko Kay (Ben, deceased) Hashimoto, Bunji Bill (Michiyo) Taguma, Goichi Bob Taguma, Mutsuko Alice (Toru) Honda and Shingo George (Tokiko) Taguma. He is also survived by nephews Kay Hashimoto, Rick Taguma, Steven Taguma; nieces Yuriko Masuda, Keiko Furutani, Julie Honda-Tsuye, Joy Yamane and Kim Gold; and several grandnieces and grandnephews. Final Viewing will be held on Thursday, April 7, 6 to 8 p.m., at Sacramento Memorial Lawn, 6100 Stockton Blvd. in Sacramento. A Memorial Service will be held on Saturday, April 9, 1:30 p.m., at Sacramento Memorial Lawn, with burial to immediately follow. Reception afterwards at the Tenrikyo Sacramento Church, 6361 25th Street (at 47th Avenue) in Sacramento. In lieu of flowers, donations in his memory can be made to the Nichi Bei Foundation, P.O. Box 15693, San Francisco, CA 94115. Kenji, your site looks great. Thanks Frank. It was just an idea on a whim, to make a tribute site to my dad. Luckily, WordPress is rather intuitive, so even someone like me can put up a site. Back in the 60’s my family used to discuss the gross injustice of the American internments for those of Japanese ancestry. I think a large part was greed on the part of those who coveted the farms owned by many. I’m glad to see that a fitting tribute was finally given for those who took an amazingly courageous stand in the face of overwhelming social pressure. Ultimately it seems your father lived a good life, a long life, with family and friends. Good for him. Aloha from Maui. Noboru’s life was a blessing for us all. I’m so thankful he proudly shared his story with me and others so the world could benefit from his courage to stand up for civil rights, peace and democratic values. Of all the people I visited for a film about internment last year, few were as warm and welcoming as Noboru and his wife and family were in West Sacramento. May his life and legacy continue to inspire others to stand firm for their civil rights. I deeply admire Mr. Taguma. Thank you for sharing his story.